South elevation of the Stockstrom Residence. 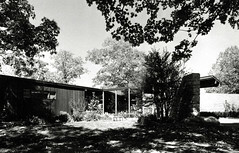 Armstrong designed the home for Arthur Stockstrom in 1949. It's located on over eleven acres of land at the top of a ridge overlooking the Meramec River valley. The address is 13290 Maple Drive, Sunset Hills, Missouri. The main entry to the house is located at the far right below the cantilevered canopy that pierces the large curved stone wall. Behind the curved wall is a private garden. The glassed area at the center of the photograph is a solarium/greenhouse built as part of the main entry sequence.